URA has released the 3rd quarter 2009 real estate statistics. Click here to go to the URA website. 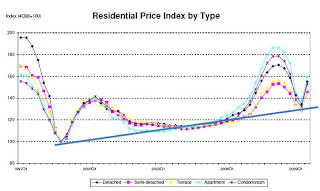 I have done a snapshot of the chart on the residential price index. I draw a blue line to see whether there is any trend. Will the index goes up some more? Is now the best time to buy property?